Pretty Handmades Book Tour: What a Lovely Book! 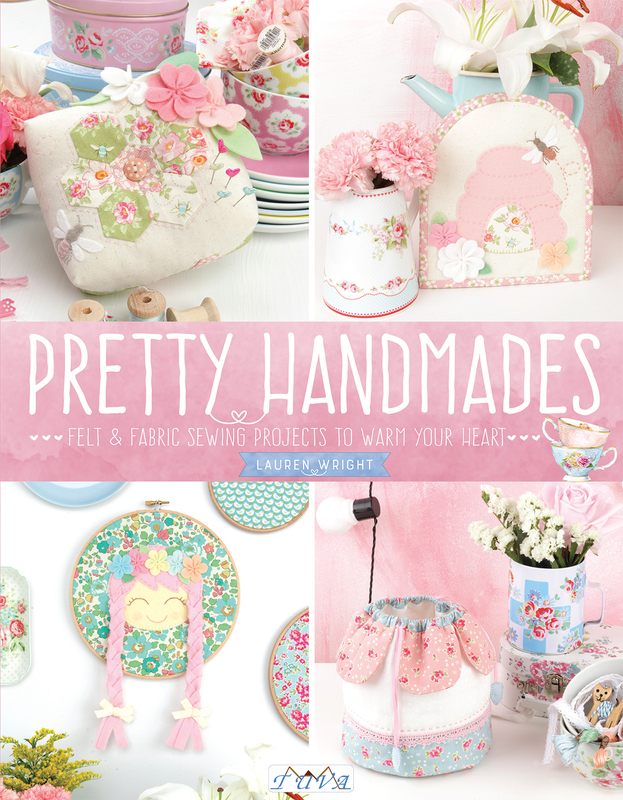 I’ve been smitten with the lovely new book, Pretty Handmades, by the talented, Lauren Wright. Not only is the book gorgeous, from cover to cover, with watercolor elements throughout the pages and charming illustrations, but the darling projects inside are wonderful to make for small gifts and special occasions (heck, anytime really!) … and all the charm and sweet has my heart melting! There are so many things in here I’m excited to make and are perfect for both big and little girls. Today, I’ll be sharing the first project I’ve created on my stop on Lauren’s book tour today. I decided to try my hand at a sweet little felt kitten doll from the book. I’ve got a soft spot for little dolls and a kitten doll … well that’s icing on the cake. The project is called the Lullaby Kitty Felt Doll and it’s a darling size (finishing at about 7 1/2″ tall). And she comes with a sweet little slip on dress to make, too. And as much as loved stitching the hand embroidered details, I decided to give Miss Kitty (yep, I named her … do you name your handmade dolls too?) a pair of her own Falsies to add a little something different for her eyes. What do you think? 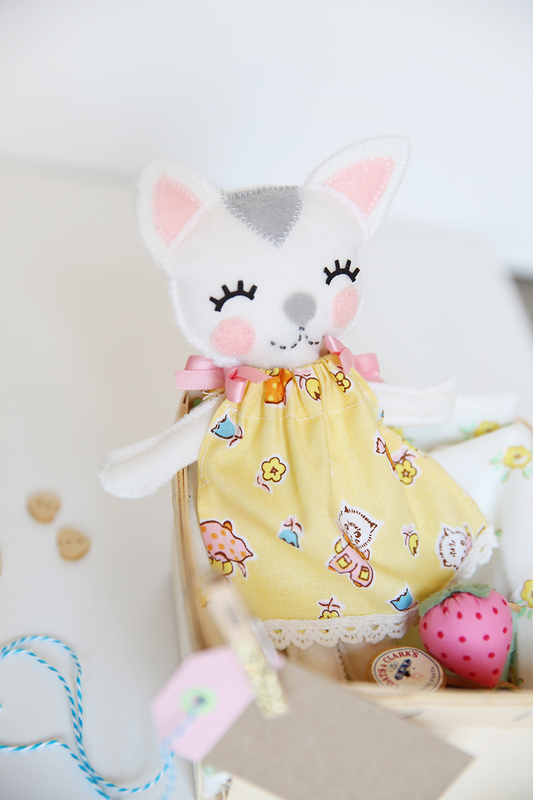 She is such a cute pattern and project – made my heart happy playing and making her! I know a special someone that’s been feeling a little down with some health issues. Miss Kitty will be a little surprise gift for her. I was thinking of adding a cheeky little saying to the gift tag. Hmmmm …. maybe something cheesy like, “I hope this little surprise brings you some joy right Meow.” Haha … any better ideas? And of course Miss Kitty needed a kitten themed dress. This fabric is from my first fabric line, Milk, Sugar & Flower. I love this simple sweet dress pattern Lauren created with this project. The little bow ties add an extra bit of sweet. Many precious details in Pretty Handmades! I hope Miss Kitty brightened your day a bit. She was sure fun to make! You’ll also want to follow along the tour and see all the darling projects shared! And sweet bonus: At the end of the tour, Lauren Wright is hosting a giveaway of a signed copy of her book! You won’t want to miss it. Thank you so much for stopping by! And big congratulations, Lauren, on such a darling book! « Instagram Giveaway with Dolly Henry: Enter by Sept 4th! 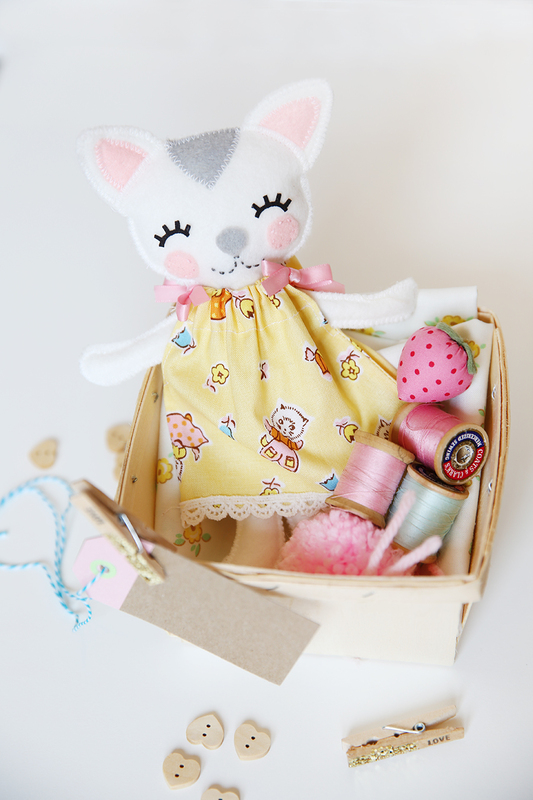 Oh Elea, I love this darling little kitty and honestly your fabric for her little dress just ties it all in perfectly! I’m excited to get this book. Thanks for showcasing this project so beautifully! Oh my gosh! This kitty is the cutest thing ever! I really need this book. Simply no words for how adorable this is! !